I did not sleep well last night. The irony is not lost on me. I am irritable and feel dreadful. I muse to myself – Did I use to feel like this all the time? – Before I learned to sleep again. The difference, is that sleeping badly is now a once in a week or two occurrence. Not every night. During what I call my transformation. I did a 30 day challenge every month. It was a way to break years of bad habits by replacing them with new and better ones. The idea of a 30 day challenge is to focus intently on changing one particular area of my life in need of improvement, then once the 30 days are over, I retain the better habits, but at a more sustainable intensity. When I first wrote about my transformation, it was at a brief and high level, I focused on the visibly tangible weight loss, it was easy for people to see. Internally there have been far more fundamentally transformative changes in my life, learning to sleep was one of them. I am only now beginning to fully appreciate what a mess I was in and I will share some of my other experiences later in the year. For now, I’ll focus on the insomnia. I do not know if more people suffer with insomnia these days or if I used to just see more evidence of it more while scrolling Facebook at 2am (and again at 4am). My suspicion is that more people are suffering. Certainly the quality of sleep seems to be on a downward trend. I also do not know if I fell into the clear definition of an insomniac. What I do know is that I never slept more than four hours in a row without waking up. It was usually closer to two hours, then I would be awake, for a while. Then back to sleep, kind of, hopefully. I felt that I was always conscious and aware, even when “asleep”. If someone asked me a question, I would have been able to answer. I eventually overcame my sleep deprivation with a disciplined routine. I am not doctor, I have not researched all the science (extensively), I do not recommend doing what I did. This post is simply what has worked for me, described as coherently as I can put together. Perhaps some of the ideas will work for you, but I am sure you have your own demons to slay. I certainly used to wake up feeling like I had been in a war with mine. Tired, exhausted. The background – When did it start? It’s difficult to trace a story to it’s beginning, as there was always something before that and something that comes later. My best estimate is that it seems likely that my insomnia started in the December vacation period of 2002/2003. I was working at a Hotel just outside Hertford, United Kingdom. I was working at the hotel to fund my University studies. I was earning £5 an hour, which was at least 5 times what I could have earned in South Africa. So I worked any and all hours they would let me. I would work as a barman from 6pm-11pm, night porter from 11pm-7am, Waiter from 7am-10am, Kitchen port from 10am-2pm. Not every day, not consistently. Some days I would start at 10pm, sometimes 3pm. Typically I did 80-90 hours a week. The problem was compounded as the hours were different every day. After two months of this, I returned to University and six months later, one of my close friends made an off-hand remark that he thought that I never slept. He was closer to the mark than he realised. I bought a computer for my room, not uncommon, but in 2003 at Rhodes University, it was not yet the default or expectation. Did I get it to work on? – Sure, maybe. To watch movies? – Definitely. After a while I started falling asleep, while whoever had congregated in my room, watched a movie. Then like clockwork, as the credits started running, so did my mind and I was awake. I used this lack of sleep to my advantage. An active social life, all-nighters binge working, I even managed to fit in an adequate amount of study to pass. Sometimes I even did well. A decade on, now in my 30s, this lack of sleep had taken it’s toll. I got to the point where when I was about to fall asleep, I’d catch myself fearing that I wouldn’t fall asleep. The fear became self-fulfilling and then I was awake again. The often quoted “sleep when you are dead“, forgets that you should live well to, while you are alive, sleep is crucial to this. What next? – Eat when you are dead? Breath when you are dead? – It’s a ridiculous statement. I cringe to think that I have quoted it on more than one occasion. There is also the proud badge of honour – “I can survive on 5 hours of sleep”, survive is not the lofty ambition we should be striving for. Very few people can function effectively with less than 7 hours sleep. We start to do things slower and we make mistakes that often outweigh in terms of time the sleep “savings”, simply it can cost us more in the long run. Sleep apparently helps entrench memories. I can believe that. I feel like I have forgotten far more than I should have. I do not know how much, I lived in a haze, a trance. Who knows what I drifted through. I don’t. I initially avoided targeting sleep as the goal of a transformative 30 day challenge. It felt unattainable. It was my white whale, my unicorn. As the months went by, I had completed mobility challenges, sobriety challenges, financial challenges, fitness challenges, meditation courses. Each one compounded in unison with the previous ones, amplifying their benefit. Not that I was running out of challenges, I was gaining momentum. I had lost 20 kgs, I began to fully internalise the power of doing the right things consistently. Note that understanding, is not the same as internalising, which is knowing in your core that it is true. Believing. Regular readers would be familiar with my process and four core pillars of my personal development philosophy, Prioritize then Focus on Habits/Behaviour and then allow the power of the Compound Effect to do the rest. With the mask of self-denial consistently being eroded, I realised that sleep still eluded me. It would be a game changer. I got to the point with sleep that I was desperate. I had tried everything before. My most successful effort in the past had been in 2010 with a concoction of Kalms, Melatonin and Ibuprofen. With it, I had been able to sleep some nights, usually better. Then some crazy dreams started and a fight to wake up in the morning. I stopped that pretty quickly. I still use Melatonin when I change time zones, but only for a night or two. I also take a couple of ibuprofen occasionally after a particularly brutal run or other physical exertion. Up until then, I had been looking for the one thing that could allow me to sleep. Anything. I started to read widely on things that could work, I went for everything. Pseudo-science or not. I was tired of being tired. I read about how our bodies associated blue light with being awake. Blue sky, day time, awake. It made sense to me. I installed blue light filter apps, such as F.Lux and Twilight, on my electronics, which kick in according to when the sun sets in whatever timezone I am in. I was not sure they were working, that was until I was doing some colour sensitive work, I switched them off, it was like “ping” and I felt myself wake up instantly. A hack, not perfect, but better. Given a target sleep time of around 11pm, I made sure that I did not have coffee after 3pm. For some people, it needs to be before lunch. I avoided eating rich foods after 8pm, the same goes for exercise, but I tend to run in the evening so was not an issue for me. I starting drinking something called bed time tea. In the early days, I’m not sure if the tea was a good thing, because when I would wake up, I would feel the urge to need to go to the toilet. Something that would not bother me now, but I was previously in a state that was hyper sensitive to irritants. The (my) mind does not switch on or off in an instant. It needs to unwind, to cool down. I had to stop working earlier, this included personal admin. To prevent the ideas circulating around and around, it is sometimes good to write them down, consciously delegating them to the next day. The only way I could fall asleep was to put on a episode from a series to watch, one that I had watched before. Then hope I fell asleep. I used to get nervous towards the end of the episode, if I hadn’t fallen asleep yet, so I’d line up another one. Watching something was a drug, just a quick fix. It had to stop. My body was tense, I am not sure which way round the mind-body connection was dominant, but I suspect it was a combination of sitting at awkward desks designed to economise space and chairs to either appease the aesthetic or budgetary needs and the stresses of the London corporate insurance environment. My mind was “tense”. I started doing various stretches during the day and ruthlessly attacked my body with a foam roller at night. I also meditated to calm the mind and body. I wanted to end each day with something positive. I chose the 5 minute journal to enable this, training my brain to scan for the positive, replacing the endless loops replaying the one or two negatives of the day or problems to be solved. I knew my sleeping environment was key, it should be a sanctuary. I heard about an experiment which showed that the smallest amount of unnatural light can affect our sleep. I had previously taped over most of the key offenders, I was surprised by how many bright blue lights are included in electronics regularly utilised in the bedroom. I switched all of them off. Including my phone, specifically my phone. 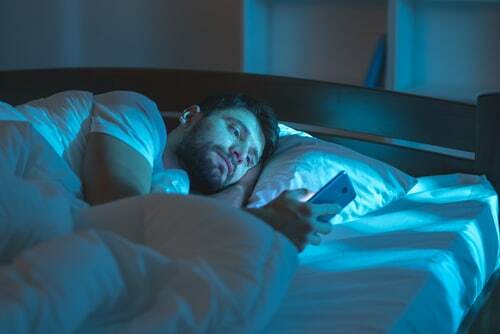 My phone was probably one of my biggest stimulants and consequently irritants, when I used to wake up in the middle of the night, I’d be bored and reach for it. Like any addiction, it needed to be satiated, I needed to satiate the boredom. I developed a routine to encapsulate all of these concepts, something that worked for me. It was intense and rigid, but doable. I factored in failure, knowing I wouldn’t get it right every time. I didn’t want to create sleep preventing stress by rushing to meet the specific time target. Close enough, was better than military precision. Regular exercise – 5 times a week, running and conditioning. I haven’t gone into the details in this post. But the sleep benefits are well documented, not to mention the health benefits. Blue light filters installed on all screen electronics. 9pm – Bedtime tea around this and no more work. Including admin. I targeted 8pm to give some flex. 10pm – Phone off. I consistently had to fight the urge initially to reach for it. Sometimes literally minutes after I switched it off. 10pm – I’d watch an episode of something enjoyable, but not too captivating to start unwinding. I’d use the foam roller during this time. Focusing on my calves, but also back and shoulders. I also used a lacrosse ball. I’d complete the daily 5 Minute Journal exercises and follow the episode with 10 minutes of meditation. 10:30pm-11pm – I switched off the remaining electronics in my room off. I’d then start reading a fantasy book. Unapologetic escapism. I read until I felt like I could fall asleep. Sometimes this was minutes, sometimes much longer. I tried not to look at the time, this would create additional pressure and stress. It was was tough. I’d sometimes lie there for hours. I’d still wake up shattered. I’ll be honest, there were a couple of nights where I took a hit of the old drug of watching a series or looking on my phone. The next night though, I started again. Aiming for better, not perfection. Slowly, I got more comfortable. Very slowly, I fell into a routine. Like the growth of a child, there were unnoticeable incremental differences each day, I learned to sleep again. Regular exercise – Running 3 times a week. Blue light filters installed on screen electronics. 9pm – No more work. Sometimes a bit of admin. Weighing up the effort taken against the benefit of one less thing to worry about. 10pm – I watch an episode of something enjoyable, but not too captivating. I use the foam roller during this time. Focusing on my calves, a problem area for me. 10:30pm – I put my phone on air-plane mode until the morning. I find the phone alarm better and less distracting than a bedside clock, where it was too easy to wake up see that it is 2am and worry that I won’t be able to go back to sleep. 10:30pm-11pm – Switch off laptops and other electronics in my room off. I then read until I am ready for sleep. Sometimes it’s 10 minutes, sometimes it’s probably an hour or so. It’s until I’m ready. No pressure. Knowing what I am waking up to can either relax or stress my mind, compare waking up to a blinking red light and 30 “important” e-mails from the US or Asia; or my morning routine described below. Wake-up between 6:30am-7am depending on where I am working and what time I need to leave the house. 10-20 minutes of meditation – Body scan, followed by visualisation of 1 year from now and then today. 5-10 minutes of stretching – I do a the “wake up like an animal” routine modified to suit me. 5 Minute journal (I do the the second half of the previous day and then first half of that day’s) and I do a daily Stoic reading. Only then do I consider taking my phone of air-plane mode. Showering, having coffee and working on my projects before heading to work. I know I should do more, but I want something manageable, that I can do consistently. Doing the right things consistently is far more important than seeking perfection and failing, then resetting to the old behaviours. Now, I am able to sleep for 7-8 hours most nights. Occasionally I have a bad night, sometimes it is because I have broken my routine recently too much or too regularly. Other times it is just the varied nature of the stresses of life. It may be because of things out of my control, that is OK, I am focusing on what is within my control. Each night I look forward to embracing sleep, I do not chase it. If I close my eyes and just need to be at peace with myself resting, that is fine to. I have found sleep again. Why not take – Dave’s 30 day sleep challenge? Whether you can’t sleep or just want to have better sleep more regularly. Challenge yourself for 30 days to a routine to improve your sleep and your life by creating a routine or modifying my routine so it works for you. Be clear on your rules (guidelines) and make it work for you. You are more likely to succeed if you feel accountable, so I suggest making a public commitment in the comments below, on Facebook or anywhere that suits you. If you feel comfortable to do so, please share your routine, successes and challenges as you progress to help inspire others. Help others, to find sleep again. Edit – 22/04/18 – I have since found that 10-20 minutes on a Shakti mat improves the quality of my sleep significantly. Prioritisation –You Need to Learn to Prioritise – Great “advice”, but what the hell does it mean? Compound effect – Do you understand the power of the Compound Effect?